Having chosen to live in France, I try hard to live French. I really do not want to be that Brit – the one that moans how they can’t get such-and such in France or that some-other from the UK is better… Certainly, in my humble Brit opinion, there is so much here that is better than back in Blighty. Bread and butter for one two things, for instance. However, I do have a beef: toilet paper! I have not yet found a product in the same league as Andrex. Indeed, I have yet to find a product that equals the premium papers from UK own brands… My tender bits are complaining. Recently we purchased a large pack of 4 ply toilet rolls, labelled “Extra Doux“. I loaded up the roll holder and forgot about it. In the middle of the night I paid a visit to the bathroom and… ouch! “On which planet is this paper considered “Extra Doux”?” I asked, receiving a grunt in reply. Well, I don’t know about him but I do not plan to blow my nose on it any time soon. No kidding, this “tissue” is not only hard but also stiff – and so crisp that it rustles. Maybe a bit of papier maché crafting – seems ideally French… So, what can I do with a dozen toilet rolls deemed unfit for purpose. Ideas? We already import Daily Shower Spray as it seems that this is not a notion that has yet occurred to the French. We have been unable, despite extensive searching, to source it anywhere over here. With our very hard water supply, it is really a desirable thing. 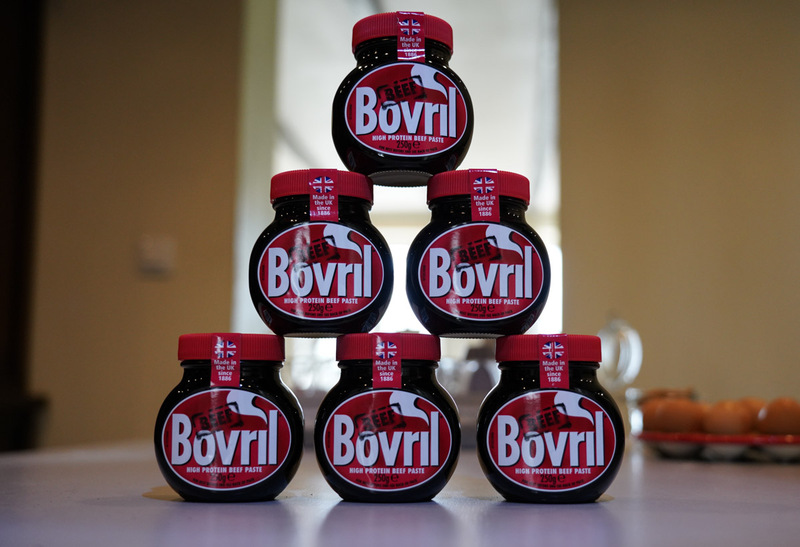 And now, a new import: Bovril. This very day, the Maison Celle Bovril Mountain was delivered. Although I am confident that I have seen this product somewhere on my travels, my need was immediate and we had no plans to venture forth to Carrefour and so Mr L decided to get me some online. I actually have no idea whether a French equivalent exists but I shall make it my business to find out. In the meantime, my daily mug of beefy goodness is assured and it gets me through my day until dinner time. Did I say “Beefy”? This stuff is nowhere as good as it used to be and I wondered why. It turns out that the beef content is only about half of this product and Yeast Extract is included. 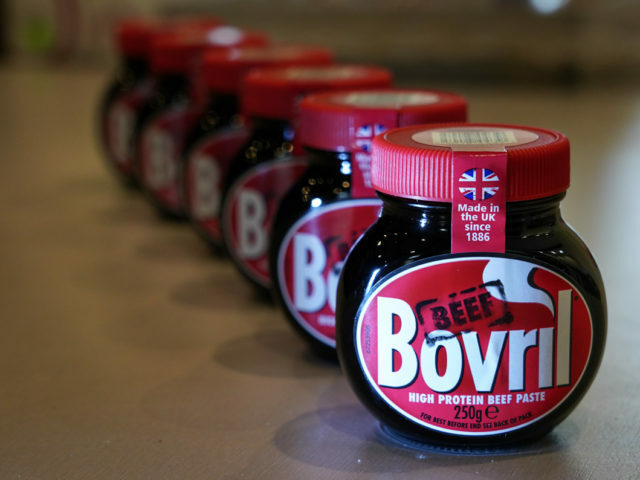 We Googled and it seems that for a while Bovril was entirely yeasty, just like Marmite. Well, I never. Anyway, this importing activity just isn’t cricket and we need to moderate our behaviours. Flushed with my success in washing the loose covers from the sofa, I dropped the armchair covers from the designated “bedroom chair” into the washer today. The designated “dog chair” will receive no such treatment as its covers are already in tatters and I fear that total disintegration would result. I stayed in this morning in case any of the expected deliveries arrived. I put my time to good use in the ongoing struggle to organize and tidy this place. It’s a wee house, very wee, and yet I never seem to get on top of it. Always so much else to be doing… and almost anything is more interesting and engaging for me than is housework. All the same, I have a vision for this place and should love to see it realised. Sadly, it comes under the heading of “one day”. For this day I am content to have pushed the Dyson around and to have waved a waxy duster at some wooden furniture. I also began to sort out some cupboards. Postie and Chronopost arrived together at lunchtime, one van pulled up behind the other, after Nell and Mr L came home – so I could have gone for a walk after all. Mr L had a swift mug of my Bovril and then disappeared upstairs to begin building the PC. It is going to be strange, sharing a computer – we have never had to do so before. Will squabbles occur? The break in the weather last week led to chill and sometimes damp conditions. We even resorted to wearing our fleeces one day but today is fine, sunny and warm. Tomorrow is set to be in the mid-twenties and the shorts may be coming out once more. Also tomorrow, there may be shopping. Whatever has come over me?